My personal experience is that you don't have much to worry about when it comes to leaving things in your airplane while you're out and about - pilots are generally pretty decent folk. But... who's to say it will only be other pilots wandering around on the ramp? With a thousand or more dollars worth of easily carried devices sitting there for the taking, it's always possible that I may return some day to find that my headsets are gone and I have no means of communicating with the folks in the tower when I get back to base. To put it bluntly, I worry about theft. Any number of DIY canopy locking schemes have come up from the always-inventive RV-12 builders, but I was hoping for something that wouldn't require cutting slots in the cockpit sills. I'm a flyer now, not a builder, so I was also hoping for something relatively easy to install. A few months ago I did a test installation of a development version of an RV-12 canopy lock designed by Aircraft Specialty. You may remember that outfit as the place that offers replacement fuels to replace the Rotax lines that have to be replaced every five years. They have now designed a simple yet elegant solution that replaces the stock canopy latch handle with a new handle that has a locking cylinder embedded in it. Installation requires drilling only a single hole in the canopy frame. All told, I think it took less than an hour. Tool needs are minimal, and I already had everything I needed except for a 6/32" lock nut, which was easily found at the Lowe's Aircraft Supply shop. I also needed an 8-32 tap, a 9/64" drill bit, and a 1/16" allen head driver. Optionally, you might want to have a little double-sided tape as well. The kit includes everything else you will need. Most of the installation is intuitive. The way it works is that the lock itself screws into the threaded hole in the latch handle. One of the three included cylinders will provide a repository for the lock's locking pin. The installation of the cylinder requires a hole to be drilled in the canopy frame, and the double-sided tape is useful for holding the cylinder in place while you match drill the hole in the canopy frame. You will have noticed that there are three* of the cylinders, but you only use one. Because of length variances in the building of the canopy latch mechanism, cylinders of various heights are included. The three provided cylinders differ in height by .020" of an inch to allow for variations in the original installation of the canopy. My installation method was to first test fit the latch handle onto the post at the top of the canopy in order to select the correct sized cylinder. The latch handle was not delivered tapped (see update below), just like the original handle from Van's. An 8-32 tap takes care of that quite readily. The lock mechanism screws right into the handle. At this point I did not use any Loc-Tite or other product to keep the lock from backing out; I saved that for last step in case I needed to remove it during the rest of the installation. The open and close directions are etched into the handle. This being an early prototype, they were oriented incorrectly. That problem was quickly fixed. I used the original screw from my old handle to hold the new handle in place temporarily. The screw that comes with the kit is designed to not be removable after installation, so I held that off until final installation too. I closed the latch (my installation required a little filing on the inside latch to make up for a little variance between my handle and the new handle), then placed the best-fit cylinder under the latch, pushed down and latched the locking pin to align the cylinder, and used the double-sided tape to hold it in place. The latching handle was then removed, and I used a 9/64" bit to drill down through the cylinder into the canopy frame. The provided hex head bold goes from top to bottom down through the locking cylinder and into the hole drilling in the canopy frame. 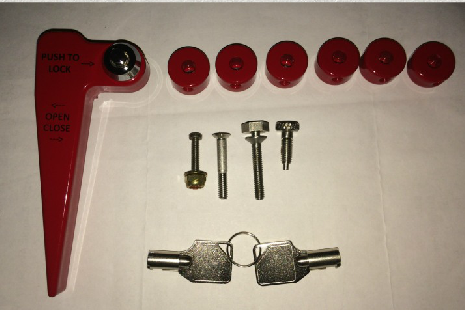 The 6/32" lock nut is fastened from inside the frame - this fastens the locking cylinder into place. Once that was done, I simply screwed the locking mechanism into that handle with a dollop of Loc-Tite and fastened the handle onto the post as usual. I didn't use the permanent locking screw provided with the kit - every now and then I have to be able to remove the handle to tighten up the swiveling action of the latch - normal maintenance for an RV-12. I recognize that by forgoing the security of the un-removable screw I will have to live with the risk that anyone with a screwdriver could remove the handle and gain access to the airplane, but I figure anyone willing to go to that length is just as likely to just break the canopy, so it seems to be a good compromise. While the handle is still red, it's a much brighter red. I too was concerned about theft. So, I ordered the production model of the locking handle. First, I had about two hours of hangar BS with other pilots interested in the new handle. Then, it only took about two hours to install.